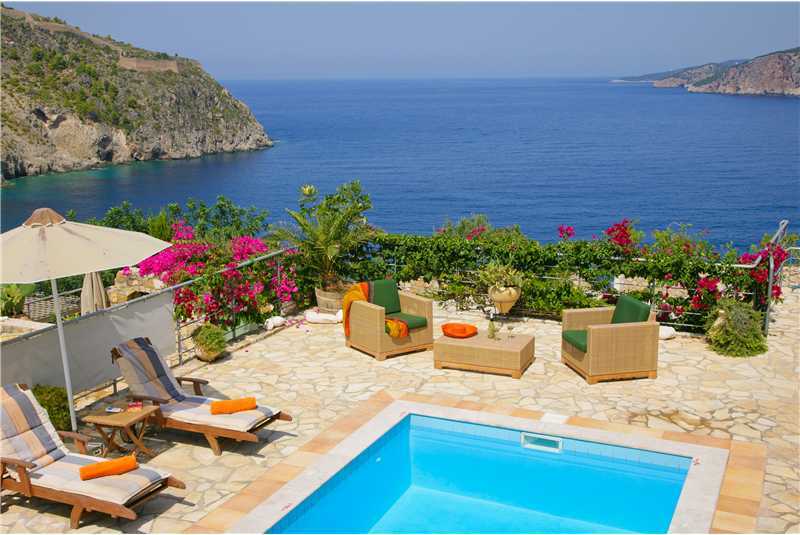 Villa Glaroni is a two bedroom villa set in an idyllic location overlooking the Bay of Assos with stunning sea views and only a short stroll from the waterside tavernas, cafes, bars and pebble beach that line the pretty harbour of Assos. 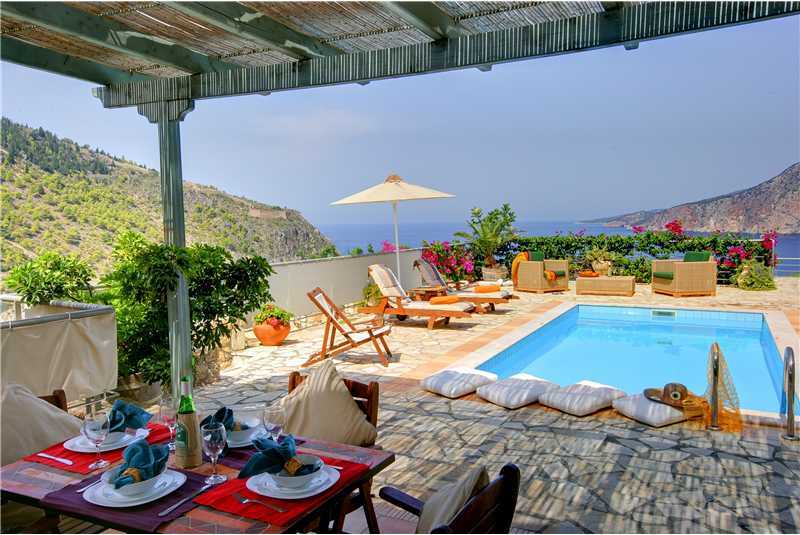 Villa Glaroni is located on the crest of a small hillside overlooking the Venetian style village and harbour of Assos. 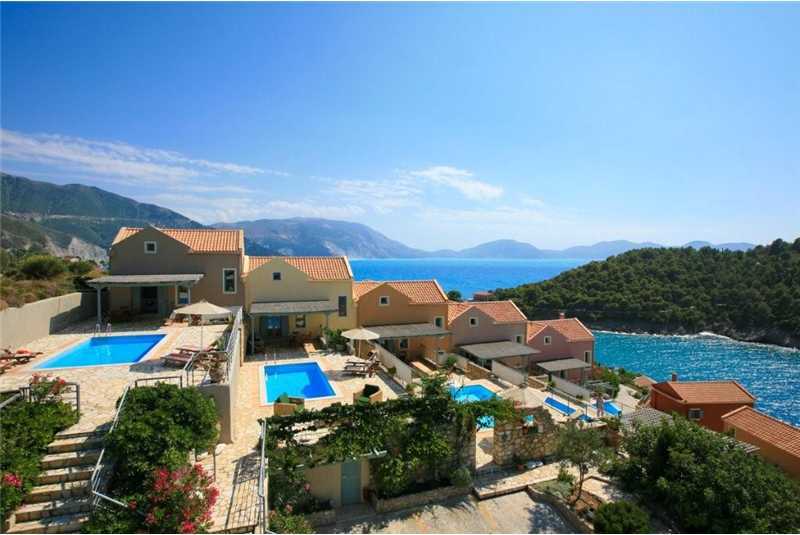 Set in an idyllic location, less than 100 metres from the sea with breathtaking views over the picturesque Bay of Assos and the imposing Venetian castle opposite. There’s a strong Venetian presence throughout the village with pretty doll like houses overlooking the yachts and fishing boats moored in the harbour. In the evenings the village lights illuminate the harbour, creating a magical and romantic setting for you to enjoy whilst dining at one of the many local tavernas or cafes that line the harbour or the village square. 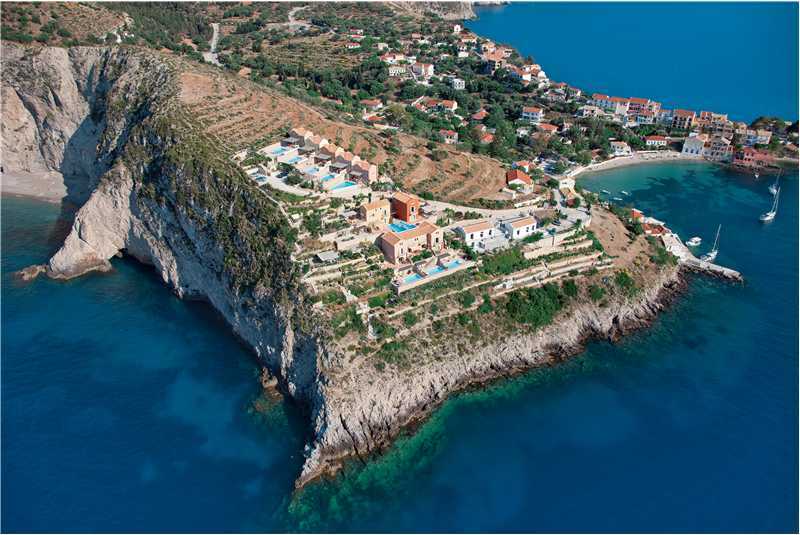 During the day Assos has much to offer with bird watching, rambling lots of walks including spending half a day exploring the Assos’s 16th century Venetian castle whose remains form one of the most famous landmarks on Kefalonia. 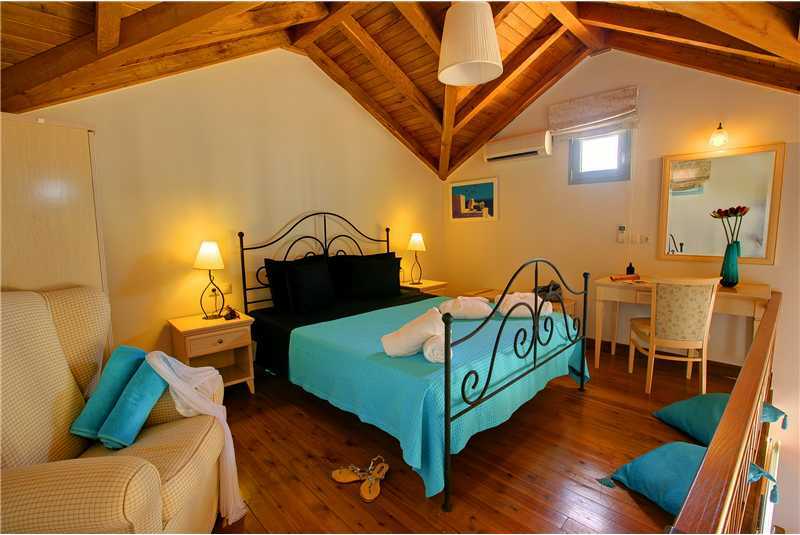 For the less adventurous simply laze by the pool or the pebble beach in the harbour or one of the nearby unspoilt coves that are only accessible by boat which can be hired locally. The snorkelling around Assos is excellent as the water is crystal clear with lots of rocky outcrops and numerous waterside caves to explore, if you are lucky you may even glimpse a dolphin or monk seal. Villa Glaroni is set in well maintained mature gardens with lots of colourful bougainvillea around the pool area and front of the villa. 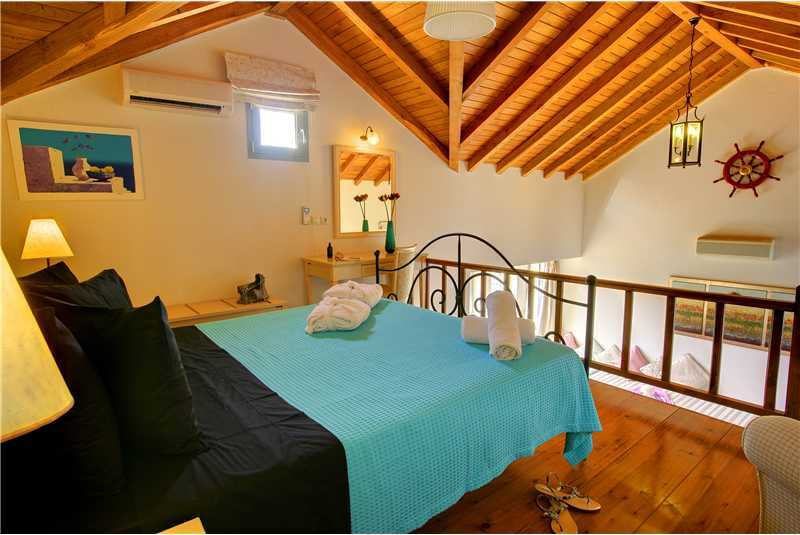 Glaroni is a fully air conditioned two bedroom terraced villa, tastefully furnished with a mixture of both modern and traditional furniture. 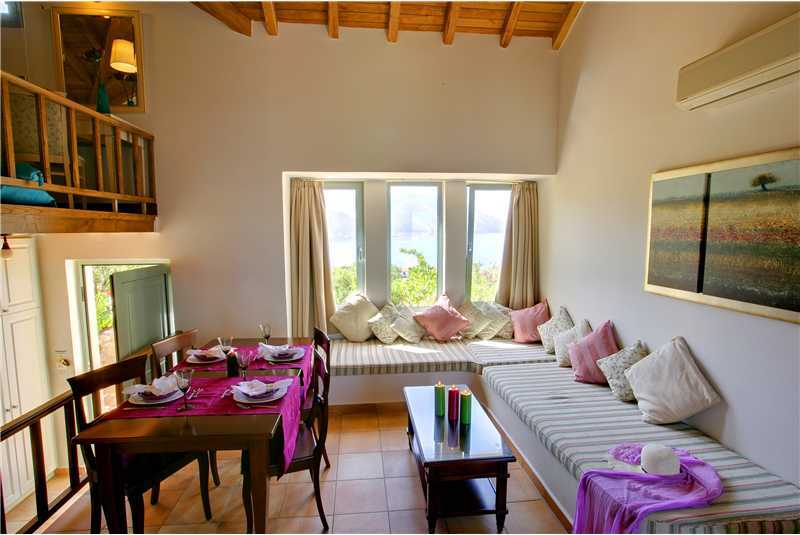 The main entrance leads directly into a modern white fully equipped kitchen which has access out onto the beautiful swimming pool terrace with panoramic sea views over the Bay of Assos. Next to the kitchen, by the front door, is the family shower room with wc, with a half set of steps leading up from the kitchen into the living area. 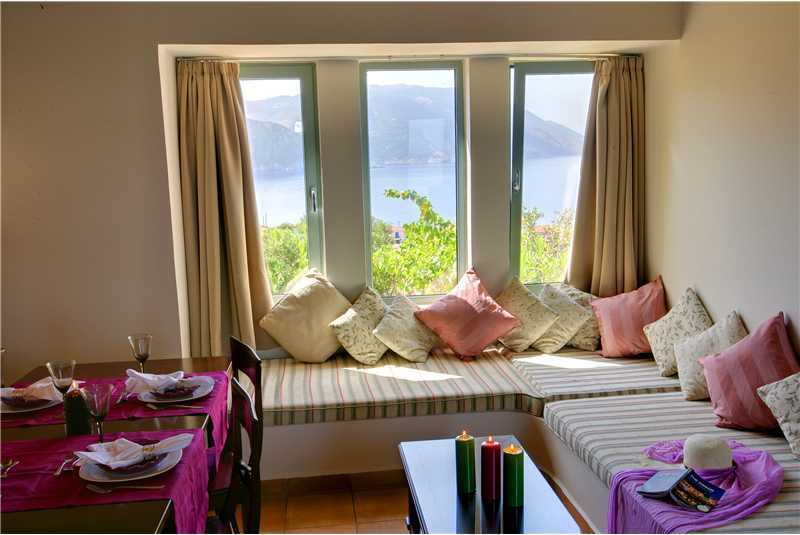 The lounge and dining room is open plan, with a high vaulted wooden ceiling and three large windows that have stunning views over Assos. 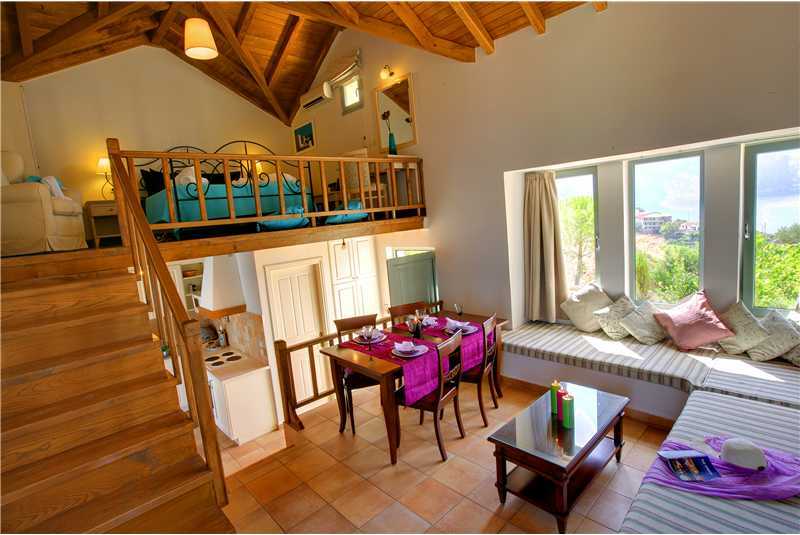 A further set of wooden stairs lead up from the lounge to the master double bedroom, located on a wooden gallery with a vaulted ceiling that overlooks the lounge below. 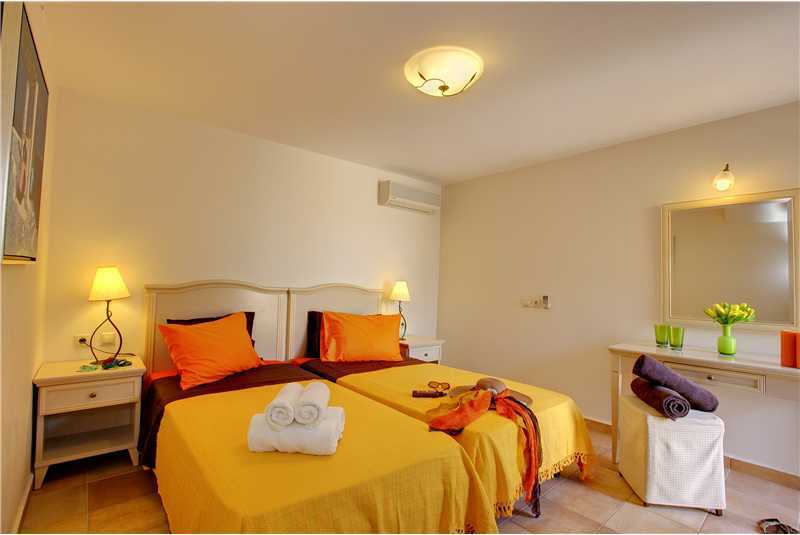 On the ground floor there is a twin bedroom with double doors that open out onto a small terrace with stairs leading up onto swimming pool terrace. Next to the kitchen is a covered pergola where during the day you can relax in the shade enjoying the views, or reading a good novel. 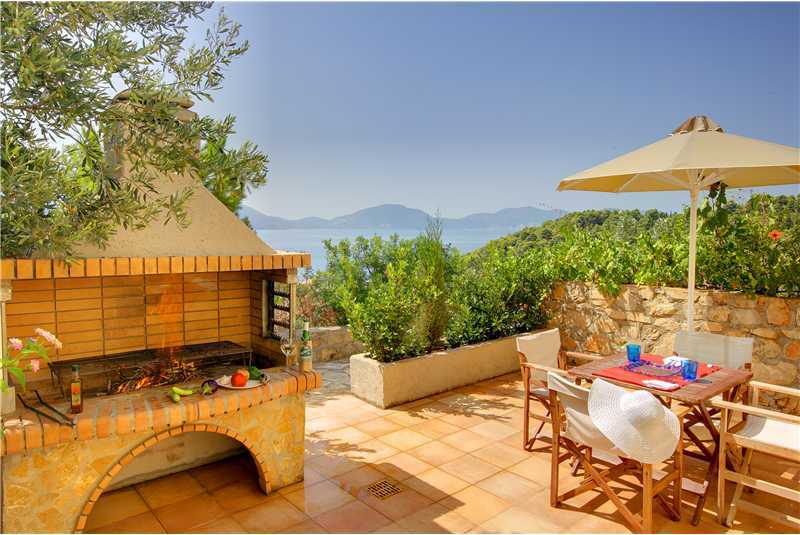 In the evenings the Pergola can be used for al fresco dining watching the sun set over the Ionian Sea. 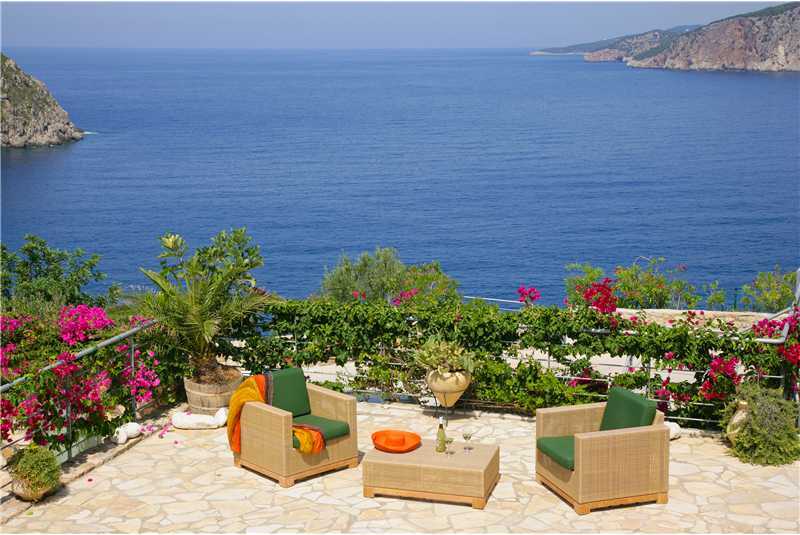 At the front on the villa is a spacious terrace with built in barbecue and a second al fresco dining area with wonderful views over the Bay of Assos towards Myrtos beach. At the end of the garden there are parking spaces with steep steps leading down to the seafront, to a small rock swimming platform, from where you can swim 200 metres to a platform beach, which normally can only be reached by boat. 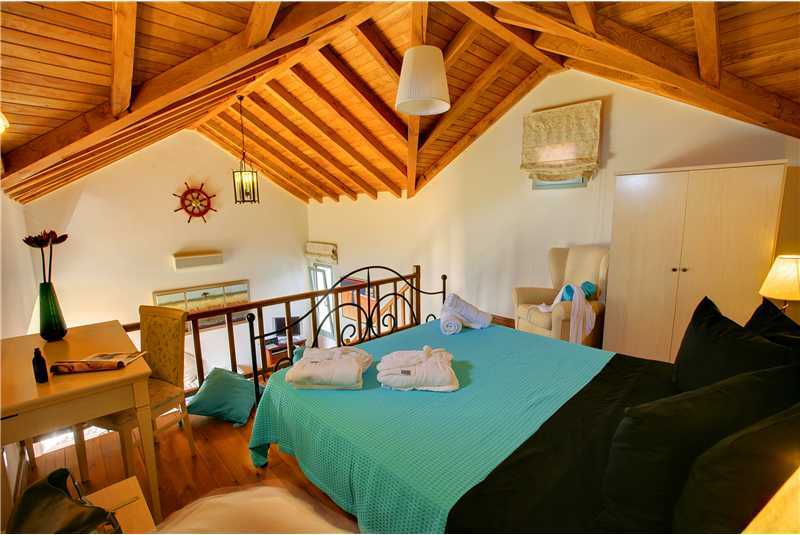 Master double bedroom with wooden beamed ceilings overlooking the lounge. 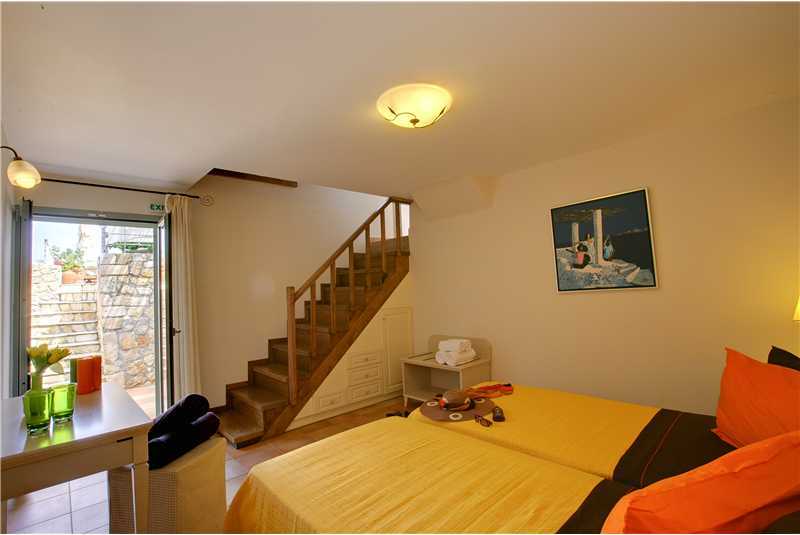 Ground floor twin bedroom with french doors leading onto a small terrace with stairs leading up to the pool. First floor family bathroom with shower and wc. 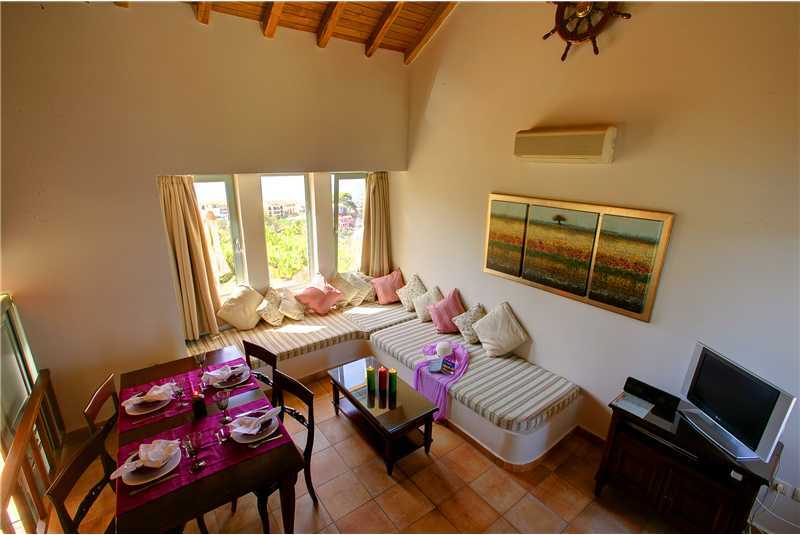 Open plan dining area and lounge with flatscreen tv, local satellite,DVD player, cd player and Ipod docking station. 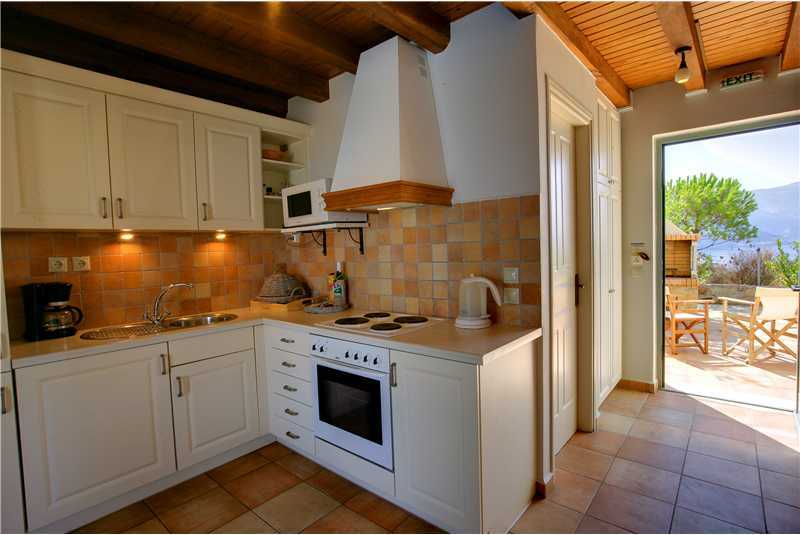 Fully equipped kitchen with microwave, full oven, fridge/freezer and washing machine. Double doors lead from the kitchen onto the pool area. Covered pergola next to the back door by the swimming pool. Steps leading to a platform beach from private sitting area at the bottom of the garden.